So umm, yeah, this is Venice. Not really a surprise there. And no, I wasn’t recently there or anything, this is just yet another one from the archives from that big trip I took there, which at this point was “awhile ago”. One of those places that I’ve got to make it back to someday I suppose. So, until then..
Notes: Canon EOS Rebel XT, Tamron 28-300mm lens. 1/400s, f/8.0, ISO 100. Focal length: 39mm. It’s been awful sleepy around these parts lately, hasn’t it? I mean, I know that Will is sitting there hitting refresh over and over and over, waiting for me to put something else up here, but the rest of us have been checked out for awhile. Something about the holidays, blah blah. And, don’t get your hopes up too much, I’m telling you now that this will be the only post this week. I don’t want to put all that wear and tear on my keyboard if Will is the only one reading it. 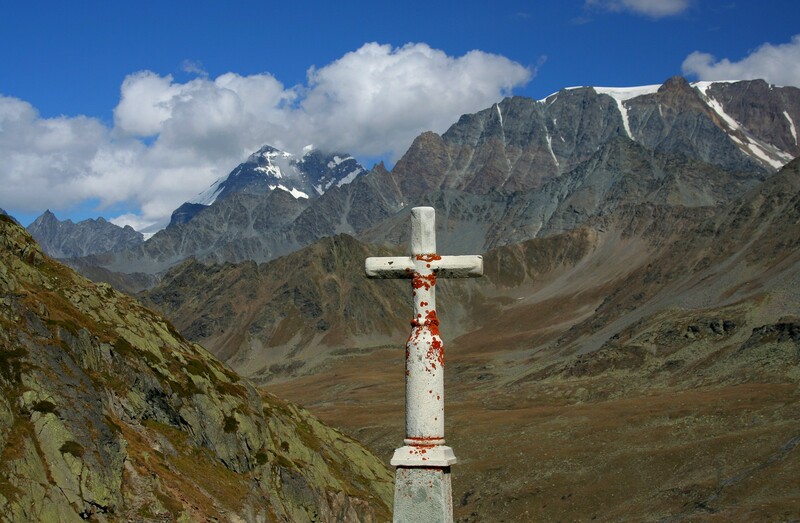 Anyway, today’s picture comes from Grand St. Bernard Pass, which lies right on the border between Italy and Switzerland. Rumor has it Napoleon marched his army through these parts back in the day. Actually, that’s not a rumor at all, it might even be true. There’s a monastery right at the summit of the pass that’s been here for hundreds of years, and yes, that’s where they breed the dogs of the same name (the ones with the fictional barrels of brandy or whatever around their neck, that (non-fictionally) are intended to rescue people caught in avalanches and such. ) Thus, the cross. The cross isn’t intended to endorse any particular religion or anything, but since it’s the time of year for Christian holidays, and I live in a predominantly Christian society, this is the kind of thing that I (and now you) get to see all over the place. Actually, I should be slightly more specific: that cross is TOTALLY intended to endorse a specific religion. However, the PICTURE of it isn’t, nor is the inclusion of it here on this blog. There, everybody on the same page now? Cool. So, enjoy your holidays! Or, at the very least, enjoy the latter part of December! I’ll see you all on the flip side. Notes: Canon EOS Rebel XT, Tamron 28-300mm lens. 1/400s, f/6.3, ISO 100. Focal length: 42mm. Man, I swear I was supposed to be born in the Alps. I would LOVE to live over in Europe (preferably either in northern Italy or southern Switzerland), but unfortunately I’m not the type that has the courage to make huge life changes like that. Sigh. I guess I’ll just keep dreaming. This is yet another picture from Parco Nazionale Gran Paradiso (Gran Paradiso National Park), in the Aosta Valley, which is in the far northwestern corner of Italy. 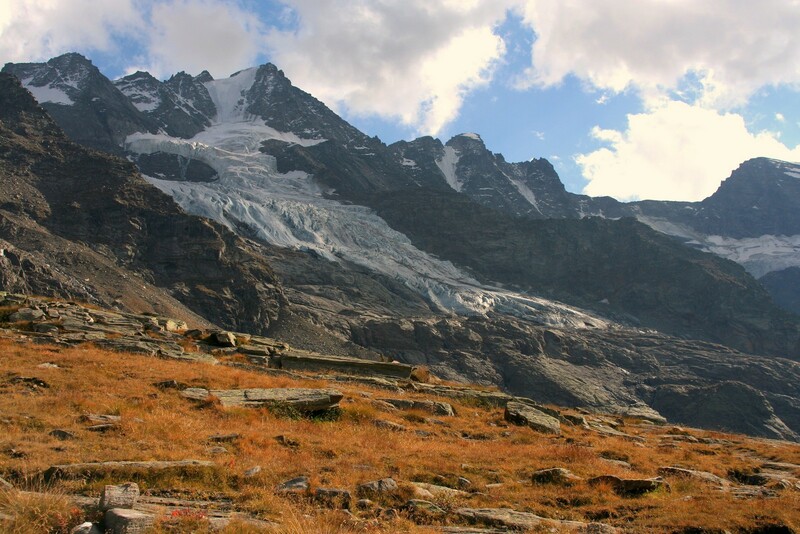 The valley is capped at the end by Mont Blanc (they call it Monte Bianco), and this is also the valley that has both St. Bernard Passes (both Grand St. Bernard Pass – where they breed the dogs – and Little St. Bernard Pass), which cross into Switzerland and France, respectively. At the time I was there, not only did I not have any kind of wide-angle lens, the widest I could get was 28mm, which is a travesty. I guess I just need to go back. This was along the Alpe Money (moe-NAY) trail, which spits out of the village of Valnontey and follows the river up the valley. We only had just under a week to explore all of northern Italy, so the fact that we were able to spend two nights in the park and go hiking for a full day was pretty amazing in and of itself. Some day I’d love to just spend a whole bunch of time hiking and exploring. But this stupid job thing just gets in the way. Sigh. Anyway, enjoy the rest of your Wednesday! Notes: Canon EOS Rebel XT, Tamron 28-300mm lens. 1/250s, f/9.0, ISO 200. Focal length: 35mm. Hi! It’s me! I just realized earlier today that my RSS feed has been sitting there broken for a couple months now. That means the HORDES of subscribers that eagerly anticipate seeing my content via Google FeedReader each day have been under the impression that either I’m super lazy or that the Picture of the Day was totally abandoned. At least one of those is not actually true!! So, to all of my RSS subscribers, welcome back!! Also among the things I realized earlier today is this: I haven’t posted a picture from Europe in quite awhile. (Months, really..) So, I quickly woke up, found one, and Wham!, here we go-go. (Too much of a stretch there?) 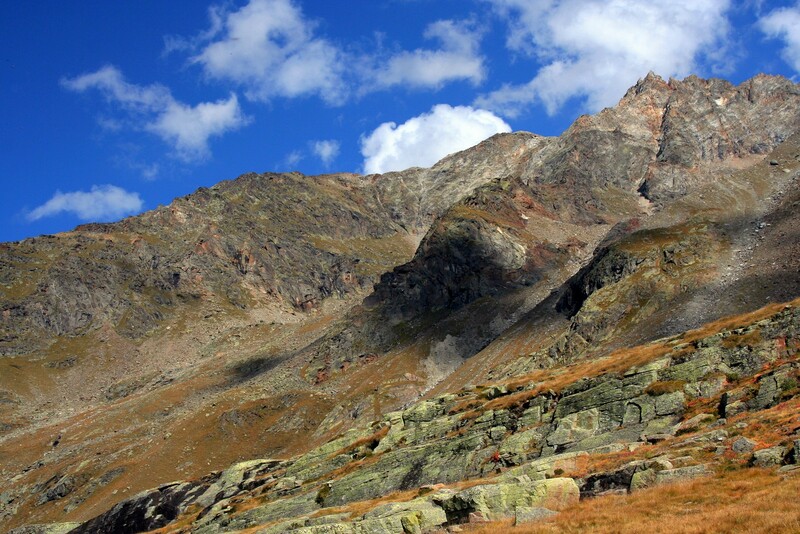 This goes back to Parco Nazionale Gran Paradiso (Gran Paradiso National Park), in the northwest corner of Italy. We fortunately had the time available to spend a whole day hiking there, and it was totally amazing in every way. Loved it, I need to go back. I’ll stop here, since all of you RSS readers have a lot of content to catch up on today. Man, I bet you’re excited, huh? Notes: Canon EOS Rebel XT, Tamron 28-300mm lens. 1/160s, f/8.0, ISO 100. Focal length: 28mm. 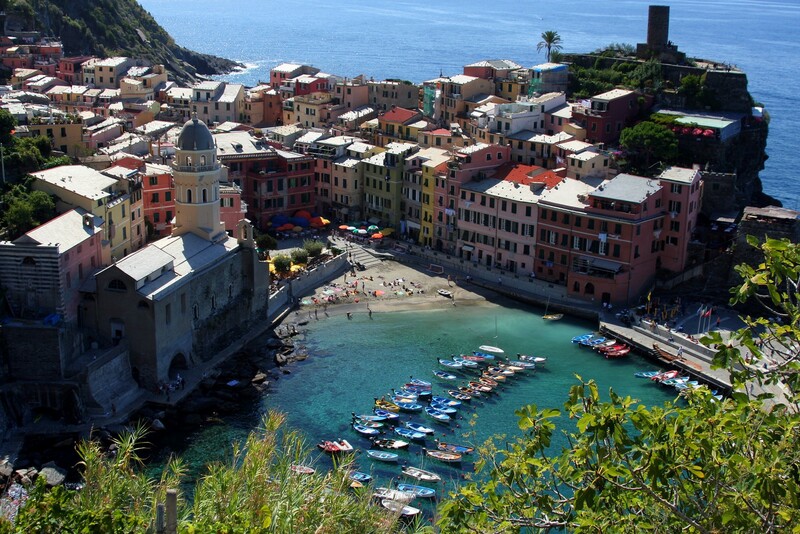 Today’s shot is a view down over Vernazza, one of the five villages that make up Cinque Terre in northwestern-ish Italy. I’ve covered this ground before, so I won’t do that here. But, this is the town where Julie and I stayed when Trevor and Heather got married over there. This picture was taken along the trail between Vernazza (the 2nd of the 5) and Monterosso al Mare (the 1st). The little tiny beach was nice enough, and the water is *amazingly* clear. It looked like the boats were just floating in the air, suspended 10 or 20 feet or whatever over the sandy bottom. That’s the second revision for that sentence. The first revision said something like “…looked like the boats were just floating there.” which seems like a somewhat stupid thing to say. Notes: Canon EOS Rebel XT, Tamron 28-300 mm lens. 1/125s, f/7.1, ISO 100. Focal length: 28mm.